It’s easy to forget how intimidating Twitter can be to new users once you’ve used it for awhile. So here are some of my quick tips to getting started using twitter. If you’re not currently using Twitter reconsider! Twitter is an incredibly powerful tool for your personal learning, connecting with others and complements your blogging. Use a twitter username that makes it easier for others to relate to you as a real person. e.g. Compare spwat3 with suewaters — which is easier? Your username can be changed anytime without affecting your twitter account by changing your name in the username field in your account settings. Make sure you complete your one line bio and add your blog URL (if applicable) in account settings because people use this information to decide whether they will add you to their account. Make sure you upload your twitter avatar asap — important to fit in and not look like a new user. Upload it by clicking on picture tab in account settings. Don’t ask start inviting people to follow you on twitter until you’ve updated i.e. start writing some tweets first!!! Why would anyone follow you if you haven’t even bothered to update? Easiest way to find and add people to your twitter account is to ask an experienced twitter user to ask their twitter network to add you (you can always ask me here for help). Make sure when they do start adding them you add them back plus thank them for adding you to their account!!! If you follow me, and only follow a few people, don’t have your twitter account set on all @ replies!!! You’ll get every tweet I send and then blame me for excessive tweeting :). Online is forever. If you didn’t want it online don’t say it in the first place. @ replies go to the person you are tweeting to and anyone that is following both you and the person you are doing the @ reply. 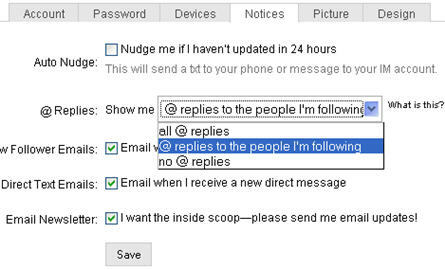 Except if your followers have their account set to all @ replies (which means they receive all your tweets). Use @ replies when you are tweeting to a specific person — e.g if you were asking me a question you would start your tweet with @suewaters. Limit your use of DM (Direct Messages) to really important private messages. These messages often take longer to access depending on what twitter client people are using and take more time to respond to. The power of twitter is in the instant notification/response to tweets of people you follow. A twitter client is a MUST; using the web interface isn’t the way to go. They provide instant notification of the latest updates and easy response to the tweets. My Tweet Map – displays the location of your follower’s tweets on a World map — interesting for seeing where they are based. Twitter has so many layers. Is there an aspect of twitter I haven’t covered and you would like to know about? Is there anything you would like me to explain in more detail? What advice would you give to people getting started using twitter? Was there a twitter client or tool that you think I should have included? Any why? What are your tips for getting the most out of using twitter? Do You Use Second Life or other Virtual Worlds With Your Students? I signed up to Twitter mid 2007 and did not tweet until May 2008. I just could not see the value in investing my time. I took up the tool, when BeTwittered became available for my igoogle. page. I then found TweetDeck and liked that idea, to organise groups of those I was following. I knew who to follow initially since I was familiar with most of the top edubloggers worldwide. My tips, are similar to yours. I like to follow top UK and Oz/NZ people since this perspective balances the US presence. I favourite tweets to peruse later. While it takes a little time, I do always review the action from different time zones. I enjoy tweeting links to good articles, reports and SlideShare. Great post. The only thing I’d disagree with is the bit about following @ replies….especially in the early stages, seeing @ replies is the single best way to find new people to follow. Since most of the edutwitterers seem to mostly tweet between themselves, it’s a great way to get in on the conversation. 1. Get beyond only posting updates quickly, and start joining in: respond, encourage, share links–this deepens your connection to this professional learning community. 2. When you a receive an email from Twitter saying someone is now following you, check their profile and past tweets before you follow them. Some Twitter users are a bit like spam artists–using the medium to sell. Check the number they’re following: 1500+ is a hint. I really like TwitKit (https://addons.mozilla.org/en-US/firefox/addon/6845) which is a great sidebar option for Forefox. Another nice one for those on Windows Mobile is TinyTwitter (tinytwitter.com). @Lucy Thanks for feedback on post. I also couldn’t imagine being without it. Have fun looking at the extra tools. @Dan I was waiting for someone to disagree about the @replies. The trouble is I get new followers who only add about say 10 people and then get overwhelmed by my tweets. Don’t blame them for thinking why doesn’t she get a life when in reality I’m trying to be nice and just respond to a person’s question. Meanwhile I have had others when I’ve been doing @ replies tell me to move to IM which also annoyed me as the person I was doing it with was only following a couple of people. @Jan Hate that when I lose a comment. Did you try using back? Good points about entering the conversation to deepen the connections and really checking profiles well. I look to see if similar field and to see who they are talking with. @Mick Haven’t tried the FireFox addon since I have an old version of Snitter that loads each tweet slowly and caters well to my needs. Meanwhile I did have a windows mobile device until I swapped it for an iphone. A timely, succinct and informative post. I shall be sharing this next time I share Twitter with other educators. Like Elaine I think TweetDeck can be useful. It is funny, I hover between the web, Twhirl and TweetDeck. Not sure why. Sue, thanks for yet another thoughtful and helpful update: Twitter has been good to me. Until recently, I’d been using Twitter regularly and found it to be a great tool for sharing quick messages and URLs with a community of like-minded people. Using Twitter, I discovered other tools such as friendfeed, OdioGo and Plurk – Twitter also gave me confidence to use them and further develop my network of friends. @John Glad you’ve found the post helpful — hope it helps the educators. I’ve not tried TweetDeck yet because I’m using Snitter and it works well for my purpose. @subske To be honest when I first set up Twitter I didn’t get it until I set up IM and saw the instantaneous aspect of it. I’ve now been using it for about 17 months and it has opened up a whole new world. Although the more you add the harder it gets to maintain the conversation but the richer the conversations become. Feel free to add me to your twitter account if you like. Great post. Very informative and nice visualisation. @Fabian Thanks glad you liked. Im not really that active on twitter anymore I like useing plurk U should try it out! though you probally already have a Plurk account. Thanks for a great update Sue. I have used twitter but not as consistently as I would like. I didn’t realise I could change my username, so thanks. I thought I was stuck with my original one forever. One thing I would like to see is: there used to be a twitter tool called twitter links. This was great, could see all the cool links that people had put on twitter in my network. Alas, no longer works. Haven’t found a substitute for this. @Julya Surprisingly enough I’ve not got a Plurk account or tried it. But lets keep it our secret as it may ruin my reputation. @Marie Hopefully you read this before you change your username. But make sure you log out of all Twitter clients especially Twhirl before you change it. Some of the clients are really hard to log out of once you have changed your username. I’m also upset by the lose of Twitter link monitor. Thanks Sue. I did try and change my username and found that I had lost everyone …. so I reverted back! Would yahoo pipes work for twitter links ???? @Marie I definitely didn’t lose my followers when I changed my account name and if you search dswaters it takes you to my new account suewaters. Twitter link monitor uses Yahoo pipes but pipes can be a fussy beast. 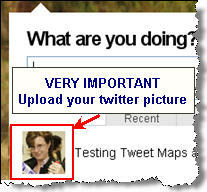 Hi Sue, thanks for the instructions – they are received in a timely fashion via your recent blog posting about twitter. I wonder if you’ve heard of and/or used Livetwitting? Let me know via email please. Thanks for the great instructions about Twitter. They are very helpful. @Carole Sorry I haven’t heard of Livetwitting at all. Organisations are starting to use Yammer. @Paul C Glad they are helpful – good luck twittering. @Neil Definitely agree that Twitter does appear really intimidating from the outside especially if you haven’t established a network. Good luck, jump in and feel free to tweet — you can get a lot out of twitter especially support and friendships. Great posting. I can give one tip and that is a site we run that simply lists and sometimes reviews over 170 Twitter tools (at the time of writing this). @Chris Thanks for telling me about your site. Looks interesting so I’ve added it to my Google Reader.